There is no end to the need of no-bake dessert recipes in the summertime. This banana split icebox cake is as tasty as it is easy. 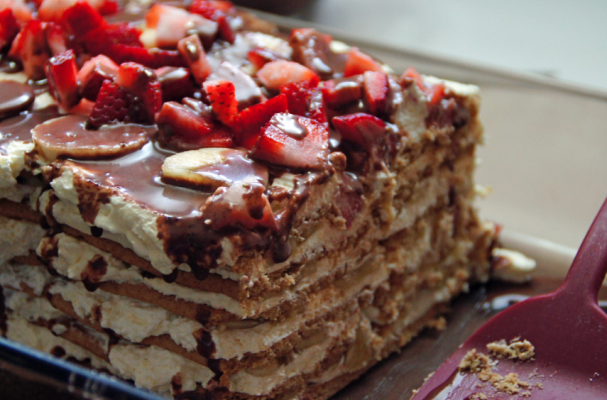 Layers of graham crackers are paired with pudding and topped with fresh fruit. Since this cake sits in the fridge overnight, the dry crackers soak up the extra moisture from the pudding which creates a cake-like consistency. Once you see how simple it is to create an icebox cake, you will preparing them all season long. Step 1: Line an 8x8 pan with foil and set aside. Step 2: In a large bowl, whisk together the the pudding mix with the whole milk until thickened. Let rest for 5 minutes while you prepare the whipped cream. Step 3: In a separate bowl, whip the heavy whipping cream with the vanilla extract until stiff peaks form. Stir in 1/3 of the whipped cream with the pudding to lighten the mixture. Fold the remaining whipped cream with the pudding. Step 4: Layer the bottom of the pan with graham crackers and op with the pudding mix. Repeat this step until all the graham crackers are gone. Top the last layer of pudding with sliced bananas and strawberries. Drizzle hot fudge over the top. Step 5: Chill the cake for at least 6 to 8 hours but overnight is best.